Detail : Not an official E.P. release, this came free in the "Beatles E.P. Collection" Boxset. It wasn't actually entitled "Rarities", the only visible title on the sleeve being "The Beatles". But that was the point of its advertising which proclaimed the box set came with a bonus E.P. of rarities. The Inner Light This track was originally on the B-side of "Lady Madonna", and later had been included on the "Rarities" album that came with the L.P. box set collection. But both these versions were in mono. This was the first time the stereo version had been issued in the U.K.
Baby You're A Rich Man This track was originally on the B-side of "All You Need Is Love", and later on the "Magical Mystery Tour" album in mock stereo. 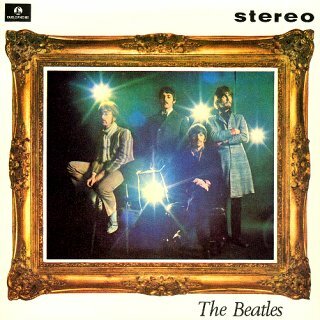 Here was the true stereo version, which had in fact previously been included on the World Records "Beatles Box" set. She's A Woman This track was originally on the B-side of "I Feel Fine", and later had been included on the "Rarities" album that came with the L.P. box set collection. But both these versions were in mono. 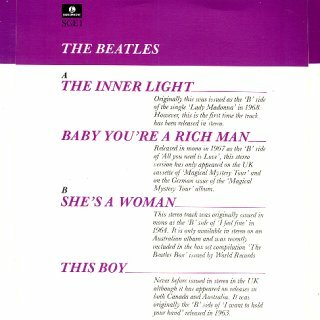 A stereo version was included on the World Records "Beatles Box", but this version here is slightly longer as it has Paul counting in, with a 1-2-3-4. This Boy This track was originally on the B-side of "I Want To Hold Your Hand", and later had been included on the "Rarities" album that came with the L.P. box set collection. But both these versions were in mono. The sleeve incorrectly states that this is the first stereo release in the U.K., but the same reprocessed stereo version can be found on the 1977 double album, "Love Songs". The E.P. was released in a picture sleeve, which was a copy of the original "Strawberry Fields Forever" front cover. Incidentally, my copy has no label on side 1.